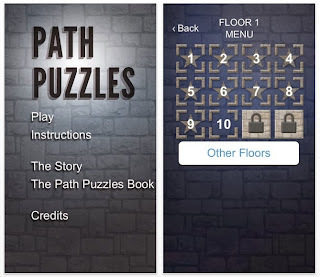 Path Puzzles is a puzzle app game that comes from Rod Kimball. You may recall that Rod wrote a book of these. http://pathpuzzles.com/ Click here to read that blog entry. Look at the second image. See the 4? 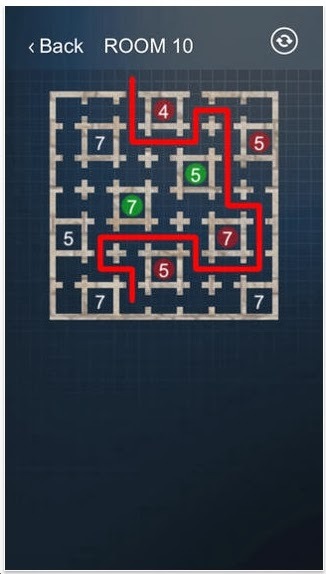 That means that the path must traverse 4 of the squares. In this case, 2 below (separated, one on top, one on the bottom) and the two squares to the right. Now Path Puzzles is available as an iphone, ipad puzzle game app. If a number turns green, you have fulfilled that number. If a number is red, you've covered too many squares. The first 20 rooms are free. Of those, I've solved 16. Loyal Blog Readers: do me a favor and download this. Besides being very good, Rod is a friend of mine. Antonio Parra recently contacted me about a few of his puzzle game apps which are all related. Damero Plus is a sliding tile puzzle. Each row and column slides around until the picture is re-established. We've seen this type of puzzle app game many times before. Here's what's very interesting and cool: the program will show you which pieces go where with arched arrows. I don't have an image of that to show, but it's helpful and very slick. Point to Point comes from Emre Dagli. Here is his description of the game: I am so excited and glad to introduce an unexplored puzzle game 'Point to Point'. 'This game is based on planar connected graph under Mathematics. Simply there are points which have the connection counts around them. You are supposed to connect points without intersection. On some levels you will face with movable point(s); in this case it may be hard to find the correct position. We've seen the 2 elements Hashi & Untangle of this puzzle as separate, so combining them is a very nice novelty. 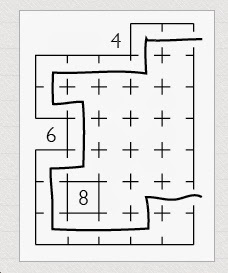 I solved the first pack of 15 puzzles and enjoyed them. Point to Point is definitely worth your time. Roto16 comes from John Swensen. The object is to get the numbers in order by rotating groups of 4 tiles at a center point. Look at the image: the 4 tiles in the upper left corner are rotating. When you're done with that group, you can place the center of rotation in between the 11, 8, 2, and 12. This concept is not new. But it's hard! I played this game for about 10 minutes and couldn't switch the 15 & 16. Crazy Conveyor is a free puzzle app game that's really more of an action game. The object is to place directional arrow on the gray squares to get the blue boxes home. I've only played it a few times. There's some interesting action going on. Level 2: your boxes must speed up in order to land on a trampoline, land elsewhere, then head back to the trampoline to get to the next level. I'm not compelled to solve every level. But I think kids would find this fun. Threes! 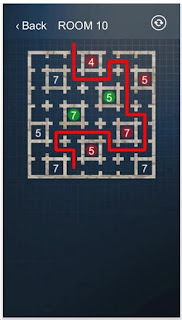 is a new puzzle app game that seems to have taken the world by storm. The object is to score points by combining tiles in a sliding motion. 1 & 2 combine to form 3. After that, only like numbers will merge: 3 & 3 to form 6, 6 & 6 to form 12 etc. The game ends when you run out of space. The new tiles that emerge are randomized. You will probably die if your board is mostly filled up and then get 3 blues (1's) in a row. Here's what you need to get a high score: patience. I swipe too quickly. Threes! leaps to the top of the list of Best Puzzle Apps of 2014. I am blown away at how good this game is. Rubik's Fifteen, the mechanical puzzle, came out around 1988 at the same time as Rubik's Clock. Both are terrific because the mechanisms are quite clever. However, both are kind of easy. It may seem that Rubik's Fifteen is double sided. Yes and no. Yes, both sides have numbers. One side is red with Roman Numerals, the other side is yellow with regular numbers. The yellow side is harder than the red side because some numbers get hidden under the black frame. I originally solved the yellow side by focusing on the red side where I could see all of the numbers, because a 7 on one side is still a 7 on the other. Now you don't have to buy the actual puzzle because the virtual puzzle is here and it's free. But the virtual model is missing that tactile magic. The annual New York Puzzle Party Symposium will take place this Saturday. Are you interested in attending? Contact me through the comments section. Your task is to get a blue dot from the factory to the blue home. You must turn pipes so the dot can travel. Along the way, you will have to pass through a machine that will change the color of your dot. There is also a device that will provide a ricochet action that you will need. Do you know the Grabarchuk family? They are non-stop puzzle designers. Here are my previous reviews of their puzzle apps: Fish Crackers Sliding Tile. Strimko Gold Icut. Puzzlium: Prologue is a compilation of these - all in one shot for just $.99. Incredible bargain. I'm flabbergasted by the sheer number and quality of these puzzles. (Actually, Strimko is not included.) The user interface is very slick and polished. The Sliding Tiles set of puzzles alone is worth $5.00. My only qualm: I can delete the old Sliding Tile app, but if I do, I lose all my progress. And I can't transfer my progress to this new app. A very strange problem I have. You absolutely, positively, must purchase Puzzlium: Prologue. There is a terrific balance of easy, medium & hard puzzles. It will keep you busy for many many moons. There's a great number of easy puzzles to get your kids hooked. A very surprising math lesson. What is the sum of 1 + 2 + 3 + 4 +.......to infinity? Should be infinity right? Check out this video. It's about 7 minutes long. You do not need to know calculus to follow the logic. Please share your thoughts about this in the comments section. Hashi Bridge is a free puzzle app game https://itunes.apple.com/us/app/hashi-bridge/id792603343?mt=8. The object is to connect the numbered circles to other circles. A 4 means that there will be 4 bridges to other circles. Two circles may have 2 bridges between them, no more. IQube Lite is a rolling cube puzzle game. I've seen numerous mechanical versions and a bunch of virtual games. The object is to roll your cubes around to create various patterns. Definitely okay, but not original or particularly fun. Then again, I've done so many of these in the past. Give it a try. Blocks! The Most Addictive Game is one of those, make a chain and watch the top blocks fall down. We've seen this type of point scoring puzzle app so many times. However, this one's got a time element. How many can you string together in 60 seconds. I must confess: I really like this speed challenge.